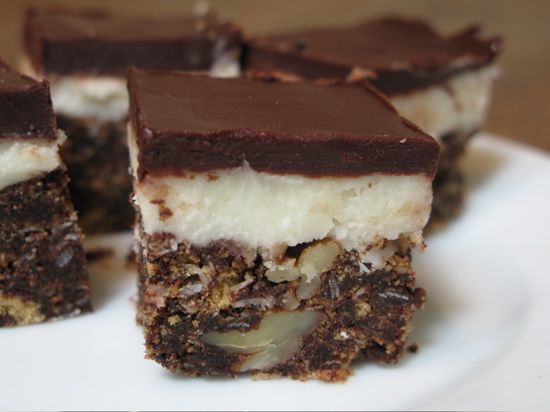 I first came across a recipe for Nanaimo bars in an old issue of Sunset Magazine. It was over the top with butter and sugar, but I couldn’t resist trying it out. And from the first bite, I was a fan of this indulgent combo of chocolate and buttercream with its irresistible balance of cake-like base, creamy filling and brittle chocolate topping. Since then, I’ve made the recipe a couple of times a year, whenever I feel like spoiling myself or my friends. The only other person I know who makes the bars is Susan Steade, now food editor of the Mercury News. Her recipe is very similar and the bars are always a cause for celebration in the newsroom. The glorified brownies get their name from the town of Nanaimo on the eastern shore of Vancouver Island, but they have been been adopted throughout British Columba as a provincial specialty. So I made a note to myself before starting this trek to Alaska and Canada to taste the first BC-made Nanaimo bar I came across on my travels. That first bite, though, was more than disappointing. – it was disgusting. How could anyone turn chocolate and butter into something so horrible that its rightful place was in the trash? I suspect the bakery’s recipe includes instant pudding. Goodness knows, there are plenty of recipes on the Internet that call for a box of vanilla custard powder. That’s the only plausible explanation for the sickeningly sweet chemical flavor. Rather than risk such culinary trauma again, I think I’ll stick with the old Sunset recipe. Sweet butter and the best quality cocoa and chocolate are the keys. I like to use Sharffen Berger cocoa and bittersweet Valrhona chocolate. Try this version when you’re looking for a memorable dessert to take to a potluck. The bars are so rich, you’ll feel less guilty if you enlist a bunch of people to share the calories. Preheat oven to 350 degrees. In a medium saucepan, combine 6 tablespoons butter, ¼ cup sugar, and cocoa. Warm over low heat, stirring constantly, until butter melts. Remove from heat and beat in egg. Stir in graham cracker crumbs, coconut and nuts until well combined. Press mixture evenly into the bottom of an 8-inch square cake pan. Bake about 20 minutes, until base begins to darken slightly. Set aside to cool. In an electric mixer, beat ½ cup of the butter with remaining sugar, milk and vanilla until smooth and fluffy. Spread this mixture evenly over the crumb crust. Place remaining 2 tablespoons of butter and bittersweet chocolate in a small metal bowl over a saucepan of simmering water and stir until smooth. Spread melted chocolate over the buttercream filling. Cover and chill 1 hour before scoring the top and cutting into squares. Will keep several days refrigerated. I remember a cafe in Fairfax that used to sell those. Dangerous! Never made them myself but the recipe sounds pretty easy, albeit decadent. nanaimo bars! i make them for canada day. my recipe has some vanilla pudding powder in the filling, though. Oh dear, Heather. I had forgotten yours. I agree they aren’t sickening. Quite the contrary. I don’t know how to explain how bad those bars were then. These sound like the ultimate in decadence… somehow I think Swedes would never appreciate them. Sigh.